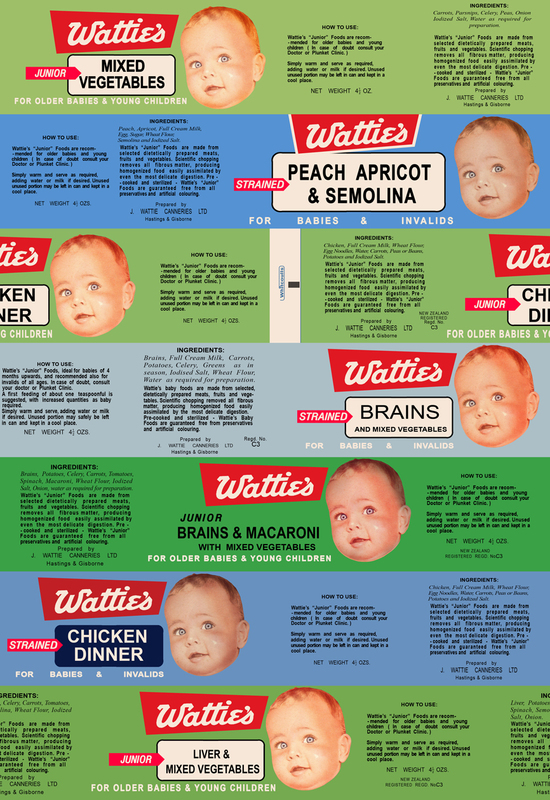 Wattie’s baby foods can labels over a number of years, from top: 1968-69/1972-73, 1966, 1968-69/1972-73, 1968-69/1972-73, 1958, 1966, and 1968-69/1972-73. I realise that I have done probably ten or more posts on Wattie’s over the last couple of years, and I still haven’t gotten around to a “definitive” one. Well, it’s on the list, with quite a few other things – believe me. There is a lot of ground to cover on that brand but today I am just going to focus on the ranges of baby foods that they did. 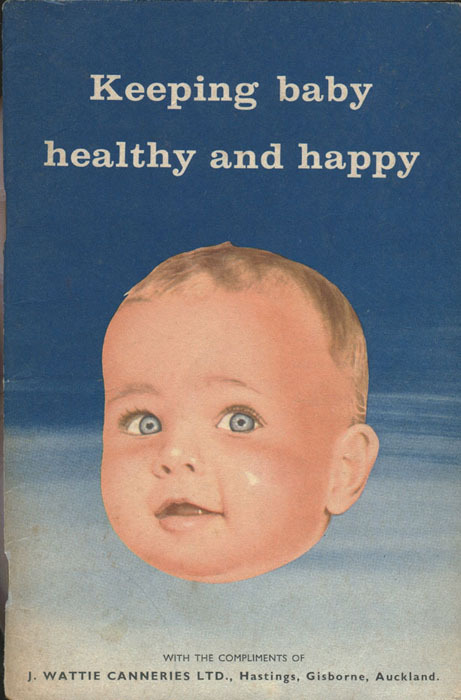 There were various Brands of what was considered “infant foods” in New Zealand in the early days which usually went in hand-in-hand with what was dubbed “invalid food”. From at least the 1860s onwards the popular and long-lasting Robinson’s brand, most famous for their lemon barley water – produced barley, groats, and also a mixture of both. 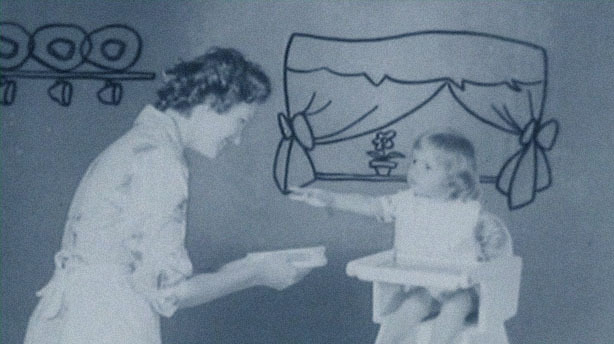 A still from one of the early Wattie’s baby foods ads, late 1950s. 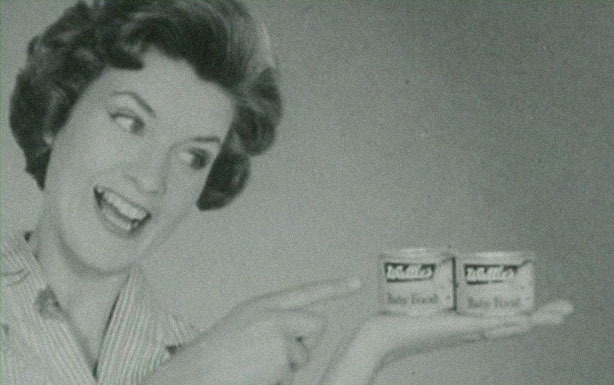 It wasn’t until the 1890s-1900s that the concept of baby food and infant dietary supplements became a trend and brands like Mellin’s, Benger’s, Neave’s, Nestlé and Virol cropped up and hung around for a few decades into the 1930s-1940s. By the 1910s- 1920s, baked rusks for teething were becoming a popular idea specifically marketed to infants. Probably the most popular and long lasting brand of all was Glaxo by Glaxo Laboratories (NZ) Ltd, which was created and made in Bunnythorpe in the Manawatu-Wanganui region when Joseph Nathan and Sons founded the factory in 1904 (starting out as Defiance brand dried milk powder and butter). 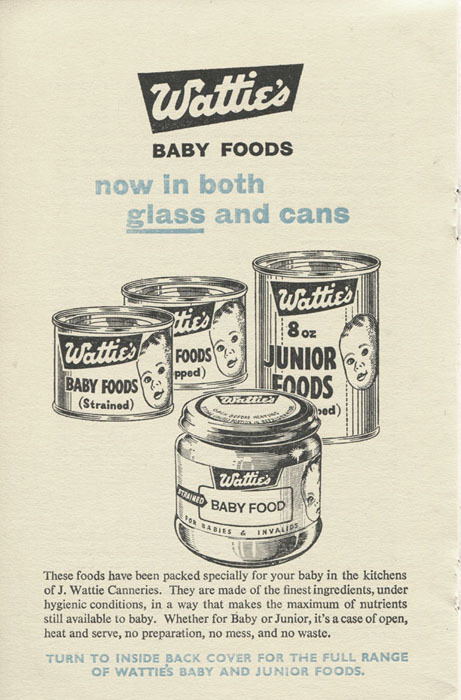 Wattie’s first launched their infant food line in 1958 in direct response to the government cutting imports of this product by half. The company immediately responded to this opening in the market with apple, prune and meat-based meals. By the following year, the baby line had nine varieties and the junior line seven. So this was not a new concept in new Zealand; food specifically for babies. I don’t know what other brands were being brought in previously- I am taking a guess at Heinz for one.However Wattie’s can claim the first domestically produced line. 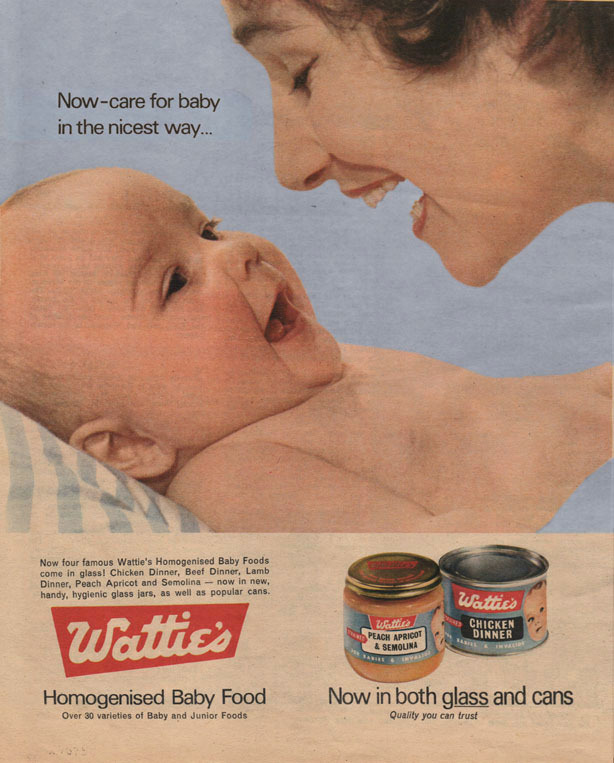 Wattie’s baby foods advertisement from a magazine, 1966. Recently I was lucky enough to get hold of a rare booklet that was issued to introduce it to consumers, well – the mothers of consumers really. It doesn’t seem that it’s early days of this product going in store because the range is quite expansive – yet it appears to be around time that the product was first being produced in glass jars in addition to the two sizes of cans – so I would date it between 1960 and 1965. 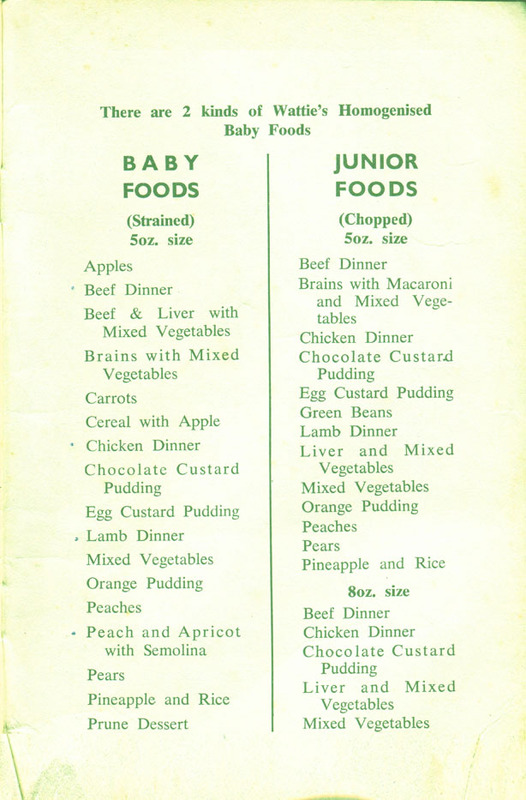 You can see a page from the booklet shows the entire list in the first range which was actually fairly large, and comprised of two lines: baby foods (strained) and junior foods (chopped, for more mature infants). The New Zealand Plunket Society was founded in 1907 in Dunedin by child health visionary, Sir Frederic Truby King – to help mothers improve infant malnutrition rates and prevent disease. Wattie’s worked with them and gained their official approval for the product – which of course was an immediate success as a result. which was probably one of the first things that I actually made when I started this project. Looking back on it now I guess it is pretty bad – but I did the best that I could of the time with little material available and the couple of collectors I approached about it – being difficult about even answering whether they had any baby food labels, like it was some kind of state secret. Anyway finally the problem resolved itself. Wattie’s relaunched the range as “Wattie’s-Plunket Society” in 1990. Over fifty years strong, the range continues to be produced today and comprises of over eighty varieties in the Baby and Organics ranges as well as additional lines of Heinz Simply and Little Kids, and also Nurture formulas and Farex cereals. Wattie’s continue to work closely with the society and and have created the ForBaby project and website resource. I have for several weeks been recreating the pantry shelf of an abandoned fallout shelter from the 1960s. It’s difficult to find original canned goods from that era, so I’ve begun printing labels and aging them with tea stains, rips & tears, rust, etc. I feel I’ll be working on this for a while, and wanted to let you know I found your blog to be inspiring, art-wise. Thanks for the nice posts. Hi, is the Glaxo in your post any relation to the GlaxoSmithKline conglomerate we know today? Yes it is. Glaxo in fact started under manufacturers and merchants Nathan, now Australian-based behemoth Lion Nathan. It is probably our biggest global success story as far as brands, since a number crossed the ditch to have success in Australia, but Glaxo is pretty much the only one that did the near impossible reverse feat of going international from Aotearoa. I am delighted to see the watties baby can photos – I had no idea people were so interested. I am the baby on the can. My mother was given a 10 shilling postal note for the photo, after it won first prize in a baby photo contest in Auckland, in 1957.